I am pleased to present the Annual Report of the National Council for Law Reporting. This report takes stock of the Council’s activities in the financial year 2014/2015 while looking forward to the activities of 2015/2016. Kenya Law continues to position itself as Africa’s leading law reporting and research institution. The Members of the Council of Kenya Law have provided policy direction and support that has ensured that the Management of Kenya Law is able to deliver on its promises to the Kenyan people. This report is in relation to the third year of implementation of the Judiciary Transformation Framework whose objectives are to ensure equitable access to and expeditious delivery of justice. Kenya Law plays the important role of ensuring that judicial decisions are widely and freely disseminated thus oiling the wheels of justice. The critical task of providing free accessible legal information to the citizenry is even more paramount as it supports the implementation of Kenya’s Constitution through engendering public participation and therefore promoting the rule of law. Our achievements have been made possible by the wise counsel of the Council members, and I commend them. I would also like to commend all staff members at Kenya Law who have ensured that our mandate is fully discharged in 2014/2015. To all our stakeholders, and in particular, the Kenyan public, I wish to assure you that we remain committed to meeting the expectations of Kenyans as expressed in the Constitution, the National Council for Law Reporting Act and the Council’s Strategic Plan. This is the third year of implementation of the Judiciary Transformation Programme and we are now beginning to see the results of activities under this programme. Kenya Law plays a very instrumental role in the justice and legal sector, as it is the channel through which the jurisprudence developed by the Judiciary, and by extension that of Kenya, is sifted, sorted and disseminated. This is especially critical in view of the Constitutional requirements on the right to information. The past year has been one of consolidation of all the gains that we have been able to achieve from the year 2001 when this institution was formally established. All the investments in ICT systems and human capital are beginning to come full circle and we are now seeing a mature institution that is not only able to manage and deliver its mandate but that is also a shining beacon of what a small group, properly focused, can achieve with the right ICT tools. The case law database has in the last year been revamped and reengineered to ensure that it is responsive to the needs of its users by being extensively searchable and the results downloadable in various formats. In addition to this we have also ensured that we minimize the time lag between the close of the year and the printing and publication of the law reports. This is an ongoing activity on which we continue to improve on. We have expanded the ambit of the database of the Laws of Kenya to include the County Assemblies, which constitute the other level of Government and, I must add, one which in the near future is bound to generate a large amount of legislation that is most relevant to the people of Kenya. There is no doubt that Kenya Law has made tremendous strides in ensuring that public legal information is freely and easily accessible. We are also alive to the fact that change is really the only constant in this field which is so reliant on communications and technology. We shall therefore continue to lay emphasis on innovation and customer focus so as to ensure that Kenya Law is able to meet its mandate of enlightening society through provision of public legal information. The year 2012/2013 has been an eventful year for the National Council for Law Reporting (Kenya Law). Most prominently, we adopted a new brand name - Kenya Law – as a catchy alter ego to our formal and legal name, the National Council for Law Reporting. Of the utmost importance is the promise of this rebrand which is our renewed commitment to to provide universally accessible public legal information towards an enlightened society. A number of innovations and partnerships have made the work of Kenya Law possible during the year under review. Our partnership with Samsung Kenya and the Strathmore University’s iLab to develop a mobile application will enable us to open new frontiers of access to public legal information for the citizen. In order to simplify and provide comprehensive legal information to the public, our website was also redesigned and revamped for improved access to case law, the Laws of Kenya and the Kenya Gazette. We have followed through on our mission of “providing universal access to public legal information by monitoring and reporting on the development of jurisprudence for the promotion of the rule of law”, by initiating a project aimed at reclaiming lost jurisprudence and publishing special editions of law reports on emerging jurisprudence. In line with the Economic and Social Pillars of the Kenya Vision 2030, we partnered with Digital Divide Data to engage in a socially responsible business process outsourcing project, where we outsourced the work of converting legacy editions of the Kenya Gazette (2007-2012) into digital web-friendly formats to a Business Process Outsourcing (BPO) service provider who employs the labour of socially and economically disadvantaged citizens. This created direct employment to more than 50 youths while at the same time enabling us to provide a user-friendly online version of the Kenya Gazette. While we celebrate the work that we have done so far, we understand that the needs and expectations of the people are ever changing and increasing and that it is our responsibility to keep satisfying and even exceeding those expectations. We remain confident that with the excellent leadership offered. The Hon. Mr. Justice W.M. Mutunga, D.Jur., SC., E.G.H. It gives me great pleasure to present, on behalf of the Members of the Council, the Annual Report of the National Council for Law Reporting for the year ended 31st December 2012. In 2012, the Judiciary launched the Judiciary Transformation Framework (2012- 2016). This framework, along with the Judiciary Strategic Plan for the same period, will be the reference points for the strategic direction of the Judiciary in reclaiming, reforming and repositioning its place as a vital, effective and independent arm of government. The role of the Judiciary in the development of a robust, indigenous, patriotic and progressive jurisprudence is a major component of this framework as is, necessarily, the role of the Council in capturing, preserving and reporting on the elements of this jurisprudence. More importantly, the Council is now discharging its mandate in the context of a country that has enacted a new Constitution and a Judiciary that is going through a phase of transformation and its role cannot be underestimated. Even as it captures the emerging jurisprudence, the Council has started to look back at previous judicial opinions that have been key in the evolution of Kenya's jurisprudence and which have been left out of reporting. As part of the replenishment of the infrastructural, financial and human resource capacity of the Judiciary, the Council has benefited from a larger resource basket that has enabled it to be more effective in its operations for now and the years to come, and the milestones contained in this report are emblematic of this. The optimal resourcing of the Council and the effective discharge of its mandate to serve not only the Judiciary and the legal sector but also to meet the Mwananchi's need for open, accessible and understandable public legal information remains my commitment and that of the other Members of the Council. Even as we take upon the challenges of years that are ahead of us, I remain thankful to our partners, our stakeholders, to the Members of the Council and its staff for their support during 2012. First, on my own behalf and that of the Board of the Council, I share my sympathies on the tragic bereavements that befell us in the last quarter of 2011. 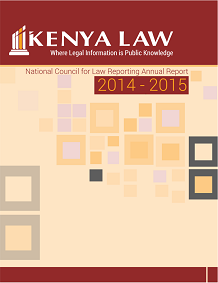 I am pleased to present the Annual Report of the National Council for Law Reporting. This report takes stock of the Council’s activities in 2011 while looking ahead to the challenges of 2012. It underscores once again the broad range of initiatives that have undertaken in fulfilling our mission of improving access to justice by providing reliable and accessible legal information to the public. Kenya Law Reports: With the support of the World Bank and the United Kingdom’s Department for International Development (DFID) through the Financial & Legal Sector Technical Assistance Project (FLSTAP), the Council published six editions of the Kenya Law Reports. The Council also published three volumes of consolidated judicial opinions on electoral law from the 1960s to 2008. This series is cited as KLR (EP) Vols. I, II & III. Laws of Kenya: Still under the support of FLSTAP, the Council published seven thematic volumes of the Laws of Kenya, namely: the Grey Book, being a compilation of Acts of Parliament criminal and civil procedure and other volumes covering the subjects of Land Laws; Commercial Laws; Public Finance Laws and Family and Gender Laws. Universal Access: The Council’s website (www.kenyalaw.org) was redesigned to improve its user interface and to enhance the universal accessibility of its content. Electronic Case Management System: With the support of the Judiciary and the United States Agency for International Development (USAID), the Council designed and commissioned an Electronic Case Management System (CMS) for the Eldoret Chief Magistrate’s Court. Kenya Gazette Archive: In March 2011, the Council launched on online archive of the Kenya Gazette with content covering the years 1906 – 2011. The availability of these historical records online was the culmination of a partnership aimed at improving citizens’ access to public legal information. The Council’s partners were the Government Press, the Kenya ICT Board and Google Inc. Parliamentary Hansard Archive: In July 2011 the Council launched the online archive of Kenya’s Parliamentary proceedings (Hansard). The content covered the years 1963 to 2011. Hitherto these records were previously available to the public in paper form as part of the public records of the Kenya National Assembly and the Kenya National Archives. They initiative was a partnership between the Council on the one hand and the Kenya National Assembly, the Kenya ICT Board and Google Inc. on the other. ICT Awards: In December 2011, the Council’s website won the prestigious International Association of Law Libraries (IALL) 2011 Website Award. The award was announced during the 30th Annual Course on International Law Librarianship in Kuala Lumpur (Malaysia) on December 12 2011. This award followed close on the heels of the Technology in Government in Africa (TIGA), a continental award for effective use of ICT in governments in Africa, presented to the Council in Addis Ababa, Ethiopia in May 2011. In 2011 the Council marked fifteen years since the enactment of the National Council for Law Reporting Act and a decade since the Council’s secretariat commenced its operations. During this period the Council has grown tremendously in human capital and productivity to establish itself as one of Africa’s leading law reporting and research institutions. More importantly, the Council is now discharging its mandate in the context of a country that has enacted a new Constitution and a Judiciary that is going through a phase of transformation. Its role in the creation of a robust, indigenous, progressive and patriotic jurisprudence cannot be underestimated. On behalf of the Council’s Board, I congratulate the management on the achievements of 2011 and convey our confidence that in 2012 the Council will remain committed to meeting the expectations of Kenyans as expressed in the Constitution, the National Council for Law Reporting Act and the Council’s Strategic Plan.